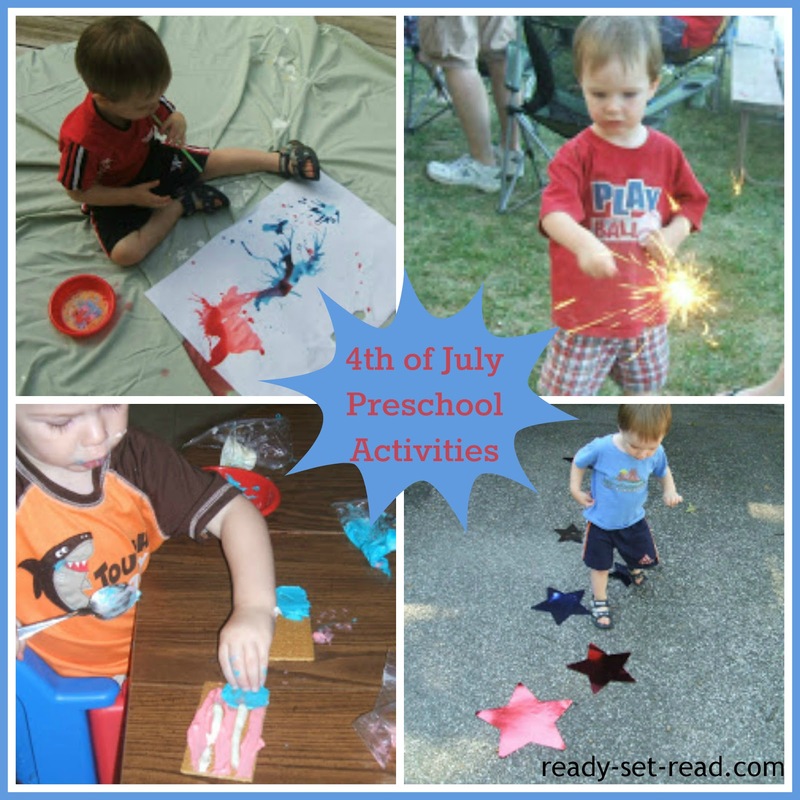 We've been busy doing many fun fourth of July activities! Here were some cool ways that we celebrated Independence day. 1. Playdough map- I put playdough on the United States on a map of the world. Logan stuck toothpick American flags into the playdough. 2. Star sun catcher. Cut clear contact paper into a star shape. Add red white and blue paper. You can use circles from a hole puncher, strips of paper, or cut stars. 3. Star Run- I modified a shape run activity from Hubbard's Cupboard. We placed several red, white, and blue stars on one side of the yard. On the other side of the yard, we placed one big red star, one big blue star, and one big white star. Logan ran, picked up a star, and brought it back and matched it with the correct star. After doing the color run, we put the stars in the driveway and practiced walking in a straight line, jumping, and hopping on one foot (or at least attempting to hop on one foot). Logan didn't really like the idea of making the flag cookies. I think it was too hard for him. So I just iced a graham cracker and he used blue and red star sprinkles to decorate. 7. Fireworks painting, using food coloring with water and straws to blow the "paint" into firework designs. (From Joyful Learning). 11. Star sort- We sorted red, silver, and blue stars by color and size. Logan and Tyson also got to go on a Fourth of July camping trip with family and Logan got to hold a REAL sparkler. This year we're going to up the ante and try out a firework show... we're even going to try and stay up after dark! such cute ideas. my three year old would love this! Sure! I thought that after I posted this and the fourth was already over ;) Good idea to repost. I like those fireworks paintings. My kids would love that and they look great!